Powerful Diagram and Flowchart builder, brainstorming and project management software. If you would ask what Giants or Fortune 500 companies are using for diagrams and flowcharts, the answer would be LucidChart. LucidChart is one of the premium application used by the brands like Coca-cola, Dropbox, Mozzila, and Tata. It comes with a simplified dashboard and secure cloud management. The single user version of Lucidchart is free which is good for solopreneurs and freelancers. Big businesses and startups can use enterprise version which has more features like the third party integration and team management. An educational and business project management, collaboration, and brainstorming software. Matchware is another award-winning mind mapping, brainstorming, and collaboration software to boost meeting efficiency and optimizing team potential. It is an effective way to organize and develop ideas, outline reports and streamline decision-making. Matchware is a PCMAG's choice which has a huge customer base of over 5 million users. Like every other professional mind mapping application, it comes with powerful synchronization with MS office and cloud storage ability. One of the most popular mind mapping application compatible with Linux, Windows, Mac and ANY other desktop application system. The program is built with Java programming language and the source code is freely available to use and alter under GNU public license. Being an open source software, the business having low budget and fewer requirements can take it's benefits which come with the cost of a poor user experience. 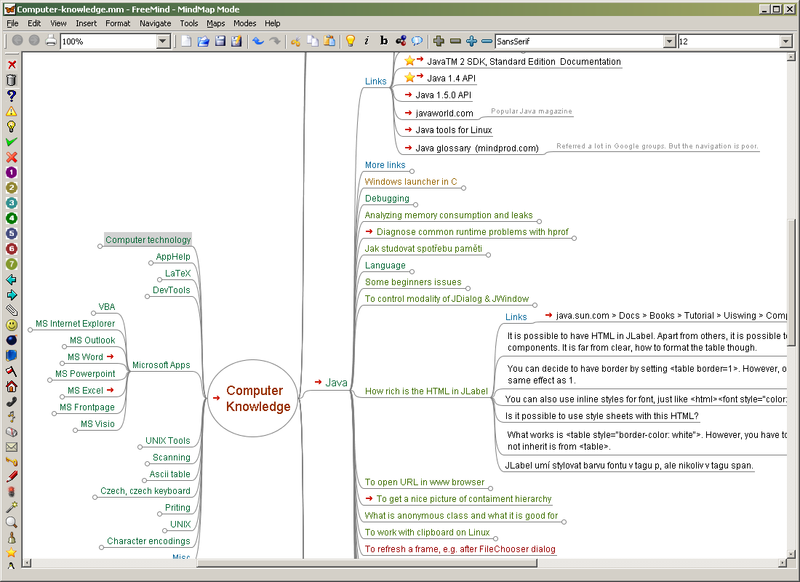 Mindjet is an award-winning mind mapping software used by many top companies. It helps you to make your business tasks more organized and to pull out the most important information from your everyday routine. Mindjet comes with a native application for Mac and Windows devices along with an enterprise version for larger teams. The projects can be easily synchronized with the other applications like outlook and MS office. One of the best features of Mindjet is MindManager which works like a physical whiteboard to gather and organize every piece of information you find useful. An open source Idea management tool to gather, analyze and brainstorm ideas and information. Xmind is a powerful and open source idea generation and management application for small and medium scale teams. Business owners and solopreneurs can use it to brainstorm ideas for teams and cloud storage. You can easily integrate Xmind with other software like Evernote and also share your projects through social media and virtual drives. Being an open source project Xmind is free to use; however, you can upgrade to premium and add functionalities according to your needs.